Rocket science? No. Yet most of us skip making our own french fries. Personally, I'm not a big fan of fries from the freezer aisle, but we purchase them regularly because they are easy. Bake for 25 minutes and...ding! Done. Though not so simple, nothing beats homemade french fries, not even fast food. This past weekend we made burgers, fries, and sweet potato fries for company. I used the toaster oven for the sweet potato fries, and two racks in the oven for the regular fries. 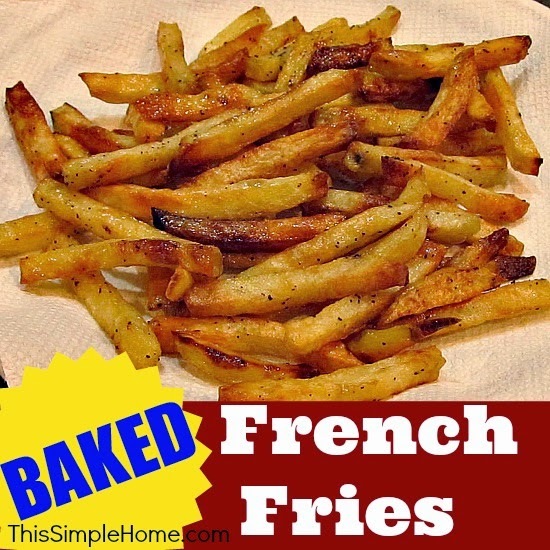 I made a big batch using my standard homemade french fry recipe. Soak. Salt. Pepper. Oil. Truly simple. I placed half of the fries on a cookie sheet lined with parchment. (Potatoes stick, and parchment paper is my friend!) The other half I placed directly on my ceramic pizza stone. After fifteen minutes, I flipped all of the fries and rotated the location in the oven. Already, the pizza stone fries were browning nicely. In another fifteen minutes, the french fries on the stone were done, but the cookie sheet fries were still potato sticks instead of french fries. The baking stone was in the oven as it preheated (just as I do for homemade pizza). I think this helps speed the baking process. 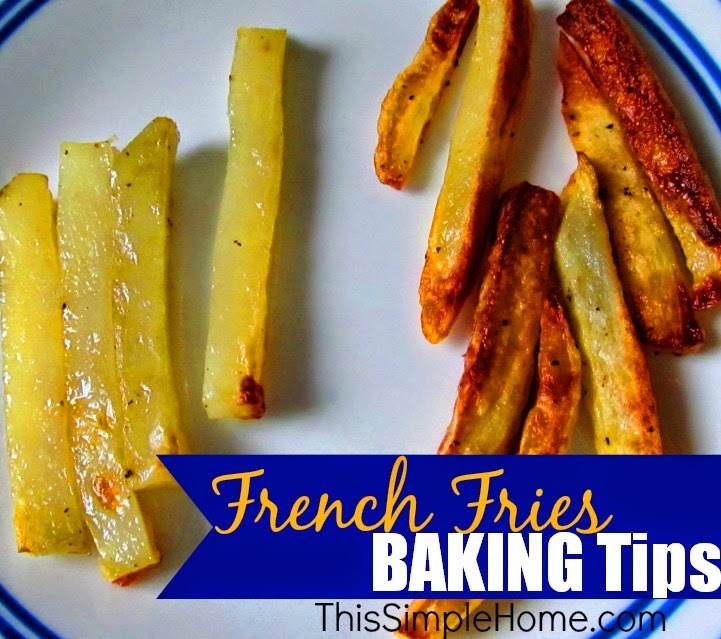 Have I talked you into making your own french fries yet? I like to make regular fries along with sweet potato fries for extra variety (along with the health benefits). Both are linked to my recipes. What's your favorite french fry seasoning? I only use salt and pepper. We love homemade fries! I don't have a stone, but I need to get one for pizza and now fries. Super tip, Now I need a baking stone. Reason #1037 why I want a baking stone!! Next time I am at BB&B I am totally getting one now! Mr. M is always making homemade fries at home. Taste much better than the freezer bought ones. I'll need to tell him about the baking stone. Are you on networkedblogs or bloglovin? I don't see a way to follow your blog. I just added you to my G+ circles, though. I need to get into one of them! Thanks for the prompt! I make my own fries all the time.. Going to have to try to make them on my baking stone.. Coming over from Bloggers on Blogger(Blogspot). Pinning. Interesting! I make homemade fries all the time but have never tried them on a pizza stone. Thank you for sharing!! I'm so glad this was helpful to so many of you! Thanks for your support! I dont' know why I never thought of trying this before! great idea. Did I tell you that I made homemade fries for my family a month or so ago when you were talking about making them. The entire family absolutely loved it. It IS hard to pass up the ones in the freezer section for convenience but you really can't beat the taste of homemade french fries! You've convinced me! I like putting paprika on my fries. Hubby made sweet potato fries tonight...gotta love Fridays - I don't cook and obviously no one else does either! Great tip! 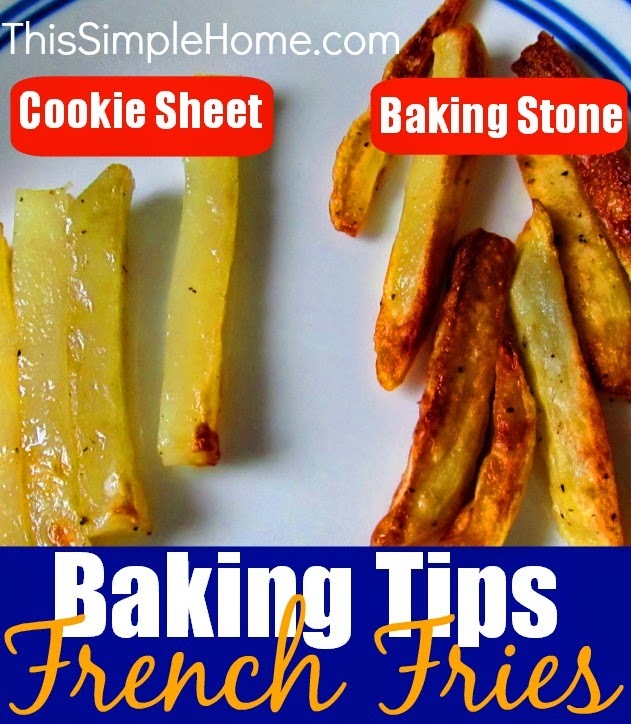 I'll definitely be using my baking stone next time I make fries! YUMMMMM!!! I would like to get a baking stone, I now have another reason. Great tips, thanks so much for sharing with Foodie Friends Friday party this week. I've pinned/shared.